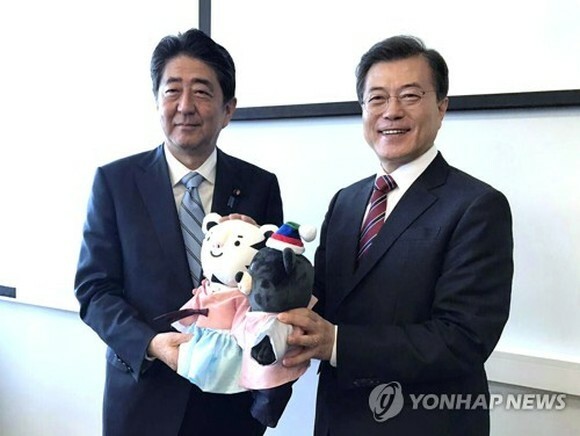 The presidential office Cheong Wa Dae on Wednesday welcomed Japanese Prime Minister Shinzo Abe's offer to visit South Korea, possibly to attend the opening ceremony of the PyeongChang Winter Olympic Games. "The government welcomes Japan's official notification of Prime Minister Shinzo Abe's trip to South Korea," Cheong Wa Dae spokesman Park Soo-hyun told a press briefing. The remarks came hours after the Japanese Embassy here requested discussions with Seoul to arrange the Japanese leader's visit. The request followed weeks of speculation that the Japanese leader won't attend the PyeongChang Winter Olympics, citing his objections to what he has called an unacceptable attempt by Seoul to undermine a 2015 settlement on Japan's wartime sexual slavery of Korean women. Under the controversial deal, Seoul's former conservative government agreed to "finally and irreversibly" end the decades-old dispute in exchange for Japan's apology and contribution of 10 billion yen (US$9.07 million) to a fund set up to support the victims. The Moon Jae-in administration has declared the deal flawed. Seoul did not seek to renegotiate the terms of the agreement but said Japan needs to make a sincere apology. The PyeongChang Olympics are slated for Feb. 9-25, with the Paralympic Games scheduled to be held from March 9-18. Meanwhile, President Moon Jae-in reiterated his call for bipartisan support to promote the upcoming events, expressing hope to meet floor leaders of both ruling and opposition parties to discuss their bipartisan efforts, according to Park. "I sincerely ask for bipartisan cooperation because there may not be any difference between ruling and opposition parties in wishing for unity and peace," the president said while meeting with his aides earlier in the day. He then ordered his aides to do all they can, including inviting ruling and opposition floor leaderships for a meeting at Cheong Wa Dae, to enhance cooperation between the government and parliament, according to Park. The president's offer to meet opposition leaders came one day after he hosted a lunch meeting attended only by officials from the ruling Democratic Party. Source from the Yonhap.